The spectre of war hangs over the lands of Gondor. The Dark Lord's henchmen came out in large numbers of Minas Morgul while the cruel Suderons marched north. 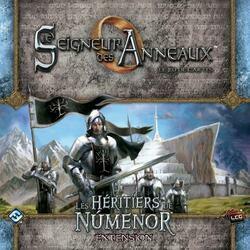 In Les Héritiers de Númenor, players will be confronted with three new scenarios where they will have to protect the Gondor from the powerful Enemy who is trying to invade him. In addition to the awesome Encounter and Quest cards, this expansion includes two new heroes and a wide assortment of player cards to customize the construction of your decks. The Lord of the Rings: The Card Game is a cooperative game in which players form a company to resist the threat of the Dark Lord.